The Sting of Failure: What NOT To Do With Bees. No, I’m not going to apologize for my cheesy title. Is that a back-door way of apologizing? Anyway, failure hurts. It makes me feel sorta stupid and naive. We attended one beekeepers meeting. One. First lesson: Don’t get bees if you don’t even have time for the meetings. We did read some books and thought if we avoided a few of the obvious mistakes we’d be fine. Let me just tell you: beekeeping is much harder than that. You really need the local bee club for help and support. Having a mentor in that club wouldn’t hurt either. So, the short story of our unsuccessful season with bees was that we didn’t manage them properly. It is especially important during swarm season. In both our hives, the original queens left with more than half of the workers. Second lesson: Don’t be greedy when you’re harvesting the honey. 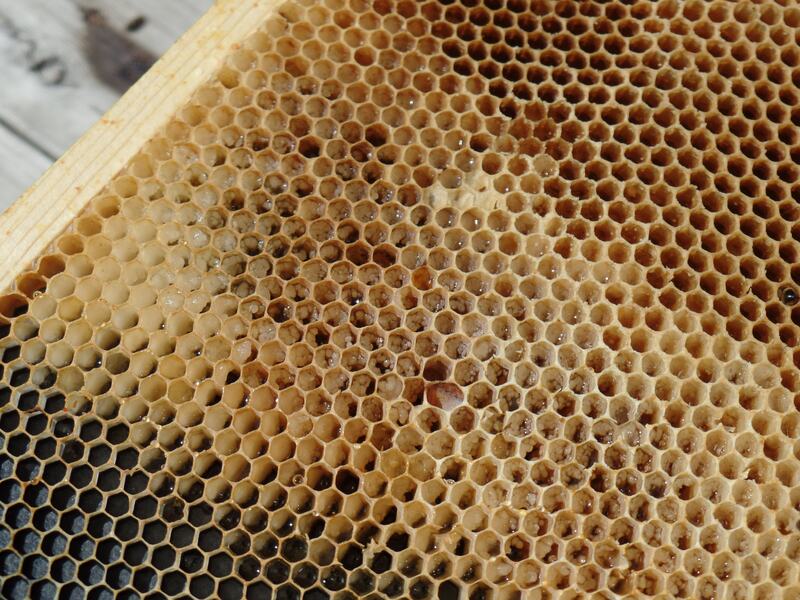 I found the smallest hive dead after a cold snap at the end of November and I gave the frames of honey they had to the remaining hive. I found that hive dead this spring. So, I took all the frames of honey, read how to harvest it, and spun every single frame in the extractor. Um, NO. Don’t do that. 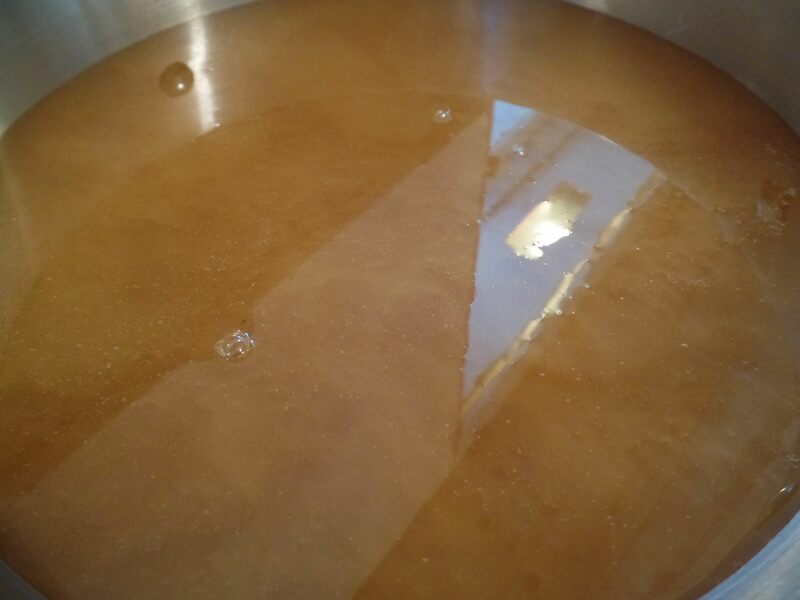 Since I did do that, I had a harvest of watery, uncured honey mixed in with some good, normal honey. It didn’t taste right and it didn’t look right either. 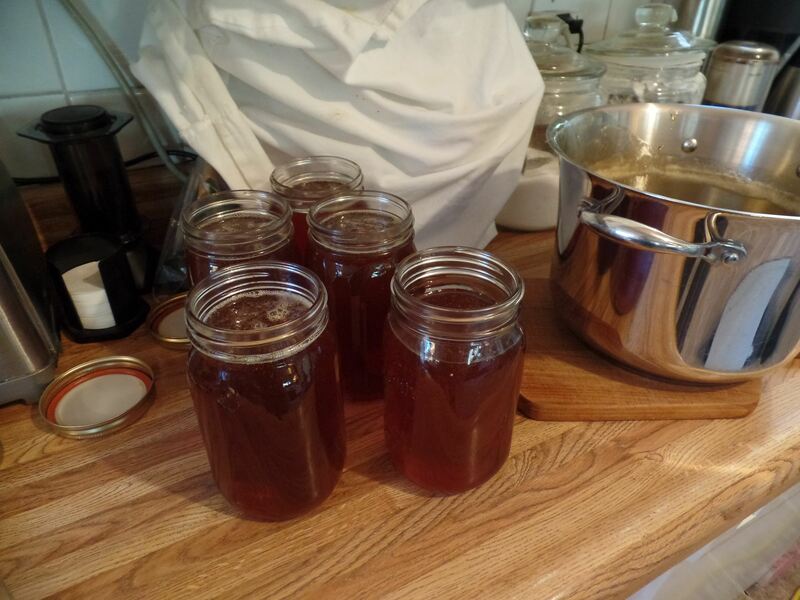 At some point after I poured all this ‘honey’ into jars, I found out that I harvested honey that had too much water content and could potentially spoil. So, 1 3/4 gallons sat on my countertop for days and days while a busy weekend went by and I thought about what to do with it. I researched “how to save your honey harvest when it’s too watery”. Nothing. Finally, I skimmed the foam that had collected at the top of each jar and poured it into a large stock pot. There was sediment in the bottom of the jars, too and I tried to leave this behind and not be greedy this time. I did, however, save a pint of the “raw nectar honey” to keep in the fridge. Part of the reason we got bees was because of the potential the honey had of helping my son with his hay fever allergies, so I wanted to save him some. I heated the pot full of watery honey slowly on the lowest setting on the stove. I let this cook for almost 2 days. The level dropped maybe a half an inch to an inch. It now looked and tasted like honey. I took it off the heat and let it cool a little and then poured it into jars. I was left with a gallon and a half. We haven’t given up on keeping bees. They are fascinating and there needs to be more of them around. We, will, however, learn a little more before we get them again.